Through the lens, I see summer fleeting by. You showed very beautiful place ! Great photos ! Great shots for the day! Love the boats!! Hope you have a great new week! Enjoy! Wonderful series, Carol! I love the shots of the boats. And the colorful life vest is a neat shot! Enjoy your week! Great photos as always. I especially like the boat with all its sails set moving out of the harbor. Good places or bad places, a shortcut is always an interesting journey! 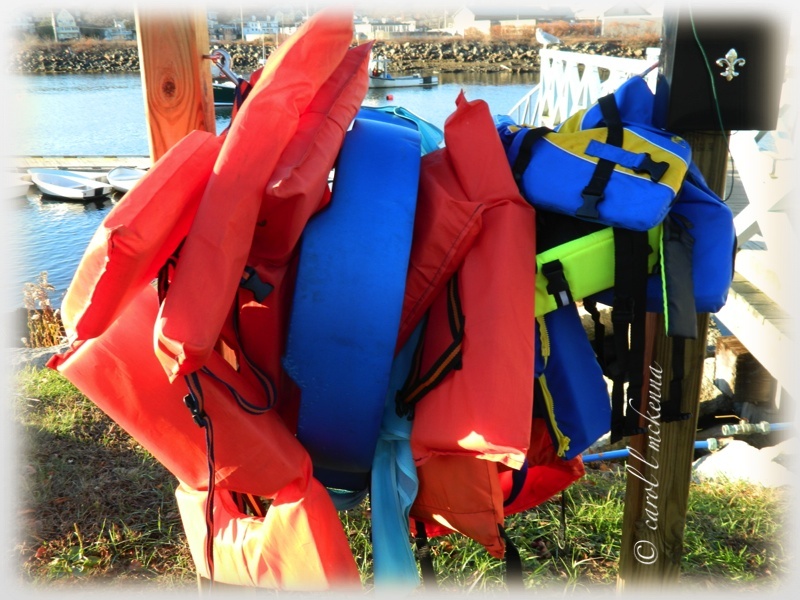 I like the colorful life jackets, all lined up and waiting for summer fun in the sun! Your shots are always so beautiful. Definitely a summery post - there's nothing like a summer near the ocean. Feathers and boats you always wonder where they have been. Hi Carol, I love these summer time pictures. Wishing you a very nice week. Nice photographs. I cannot believe summer is going by so fast. Thanks for your household hint. 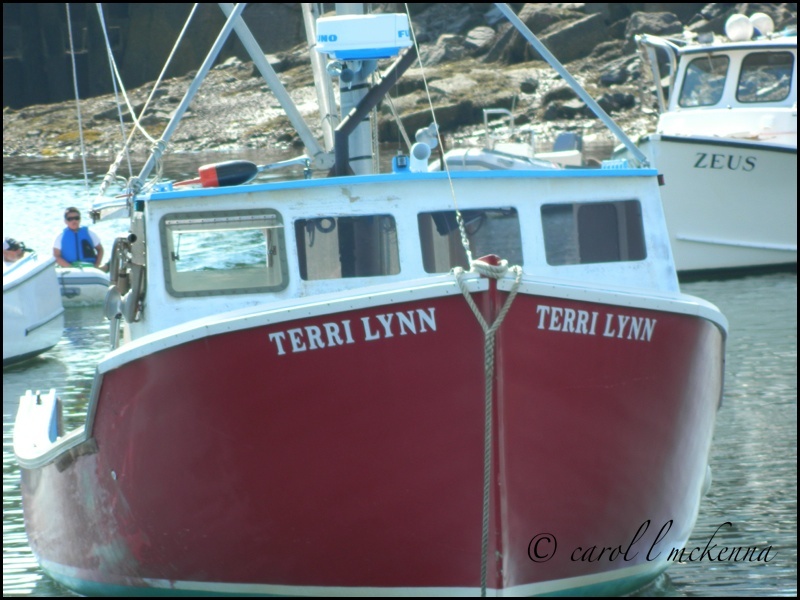 I love your lobster boat and your sailboat! What a great photo series! Mmm,grilled fresh lobster from that boat I could go for. I like the colourful life-jackets hung out to dry. That was a great close up of the boat Carol. Thanks for all your comments. have a good week. Nice as always. i like that quote especially. Nice as always, I like that quote especially. Beautiful captures. I like the way you pair them with memes. Calling by from Our World Tuesday, what a lovely series of photos. How gorgeous your photos are! I love the ocean and your ocean pictures are a balm this day. Beautiful haiku too. All of the pictures are great. The last one though, just feels summery to me, and the bright colors make it even better. Lovely pictures...and about the feather...was thinking of the one I found on our doorstep yesterday. It was unusual to find it there and it's been on my mind! What a lovely series! Thanks for sharing! What a beautiful haiga in response on Busons haiku Carol ... your post are always a pleasure to read and look at. Through the lens, four seasons have been captured. I love feathers too! Love your collection of photos! A perfect b&w contribution for the b&w theme! Summer does seem to be going by fast. These are lovely photos. I just saw a recipe for lemonade with fresh blueberries! Needed that rain quote today!! I became quite taken with feathers in the fall ... now when I see them around the pond makes me feel like a bird's been hurt... Still hoping to make it up towards you this summer. Will be in touch! 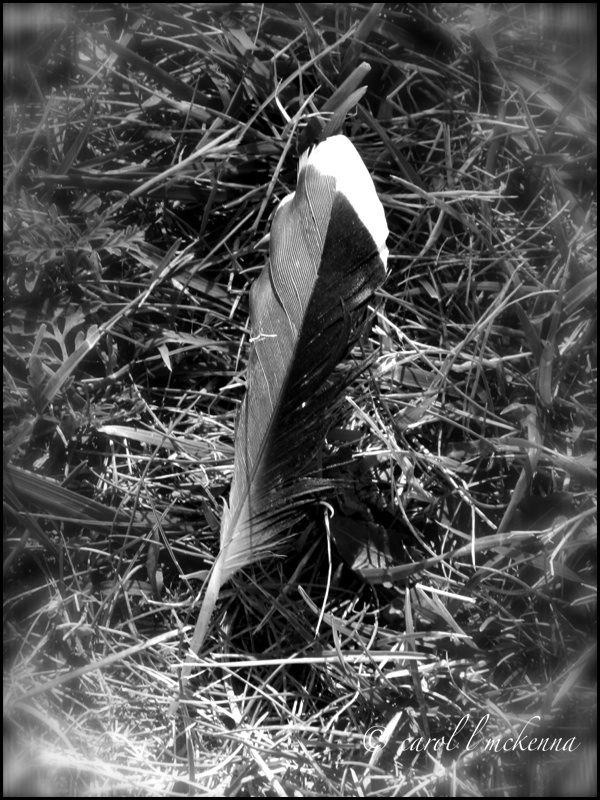 Wonderful light and shadow on your feather shot. 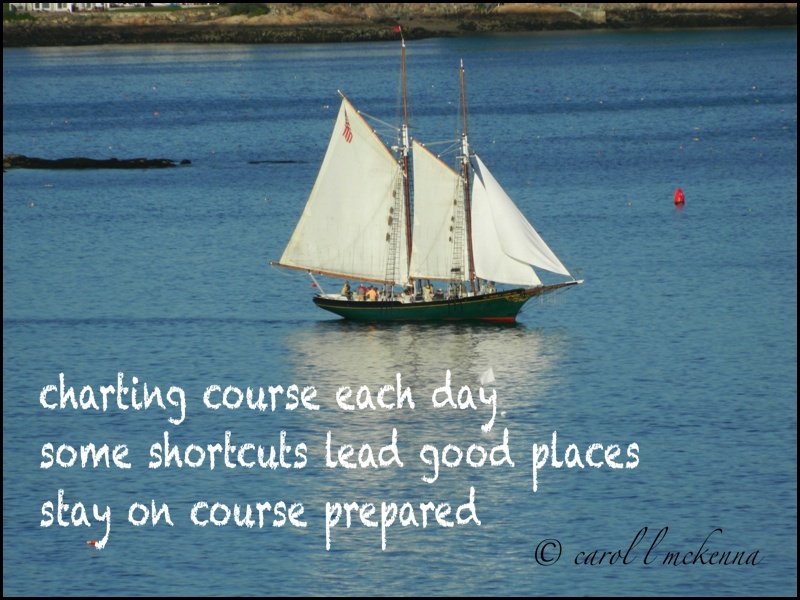 Carol, once again your haiku and photos are so inspirational! I am looking forward to fall and a drop in the humidity of summer. I know it will be here before we know it!! Beautiful series. I love your outlook on the feathers. With so many birds living on my farm, I tend to take the beauty of their feathers for granted. Thank you for reminding me that each one is a gift. Love all the life jackets piled up! Carol, I emailed you, and I hope I have the right email address. If you don't get my email, let me know. Very nice selection of pictures ! A day on the water would be so welcome right now! Such amazing shots! Love them! Beautiful serier of photos. I love the ship in the last shot. I can almost feel summer leaving us! I know it isn't even August yet, but there have been a few cooler nights and it makes me sad. Your photos, however, make me happy! Fog never looked so stunning! Beautiful photos as always, Carol. I notice the fog right away in your sky shot! It looks amazing..
beautiful sky. hope you have a wonderful weekend. Your misty photo and the haikus warm my heart. Sky posted this week is amazing! I adore L. Hughes quote. Very nice photographs. You make me want to visit. The sky in the first one was unbelievable. The lobster boat made me want a lobster. We went to Cape Cod on vacation when I was a child and we'd each get our own lobster. That was a big deal for a little kid. Oh, I love that pink sky Carol! Love that shot with the fog blanket! Visiting back from SWF. 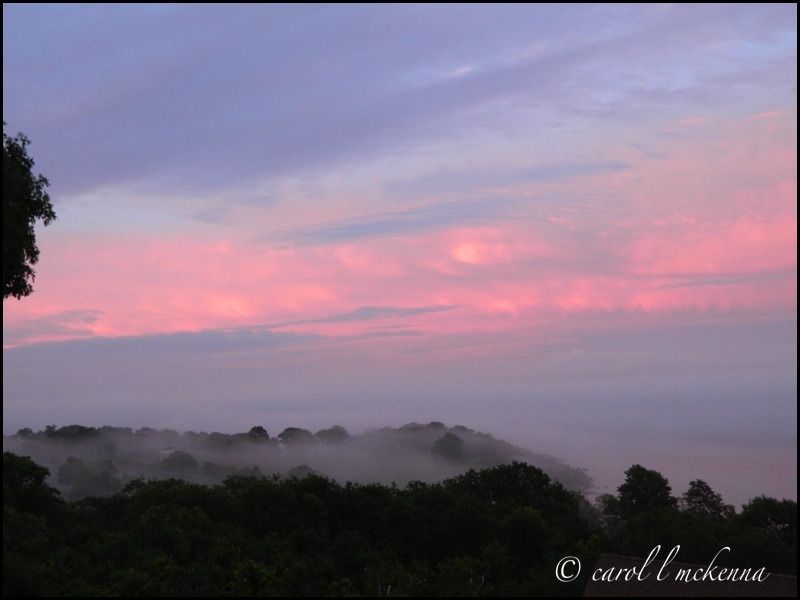 Love the pink clouds and layered fog. Enjoying other shots and haikus. Thanks for stopping by, happy weekend. HI that first shot of the sky is awesome. Lovely set of haiku and photos! That misty, foggy sky from after the rain is extraordinary!! It is good to finally let go of the pain of a loss and dwell in the circle of memories that bring joy! Have a great weekend! I know how those waves of grief go: Sometimes they threaten to drown you, and at other times they only tease you. I'm glad the waves are subsiding for you. 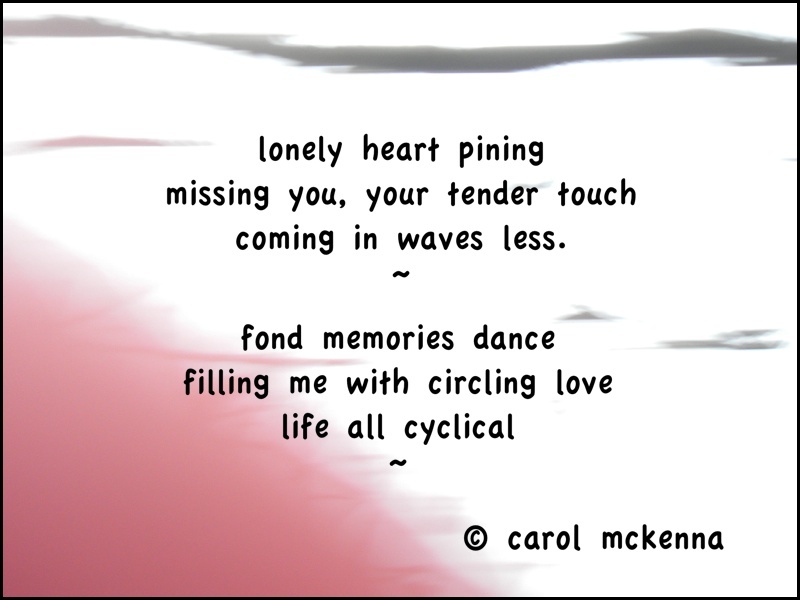 Dear Carol, your haiku... tug my heart strings... and I was just thinking today as I was driving through Northern California that summer is going way too fast... I'm not ready to feel Fall in the air... but I think it is coming soon... So, I'm going to soak up these days and the colors and feathers of your gorgeous photos! Have a good weekend my haiku friend. sweet doves! love the sky photo! The orchids look like you painted them by hand. The shadows are lovely. 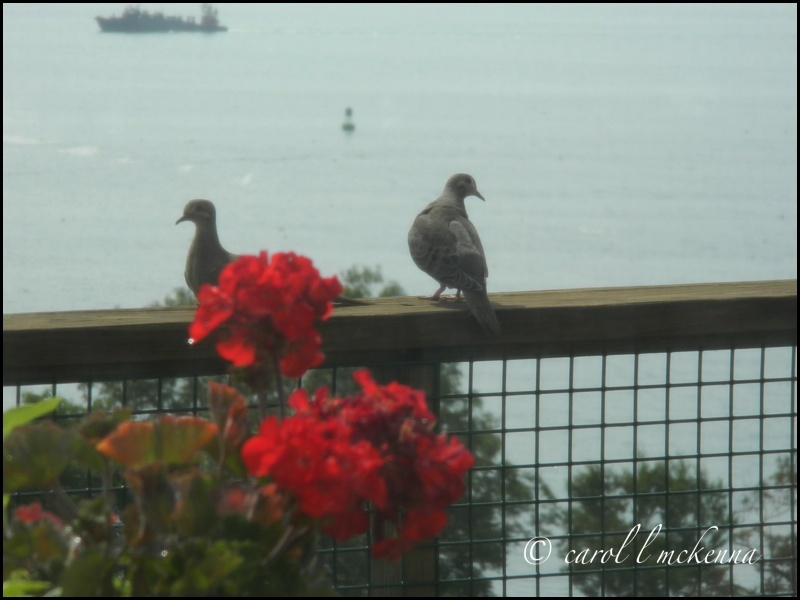 Hello Carol, thanks for sharing your doves and images with my critter party.. Enjoy your weekend! your haiku sparked my own missing my love's touch; warm love always radiated from his hands. your orchids are maginificent in their beauty. Enchanting orchids and lovely soft shadow cast by them. And loved your comment on your delightful black and white feather. A single, lone, dropped feather does seem like some fragile connection with other worlds. Through the lens, secrets of summer are exposed. Nice shots! The orchids are awesome! So far it has been a lovely summer here. looks like it's great there too! 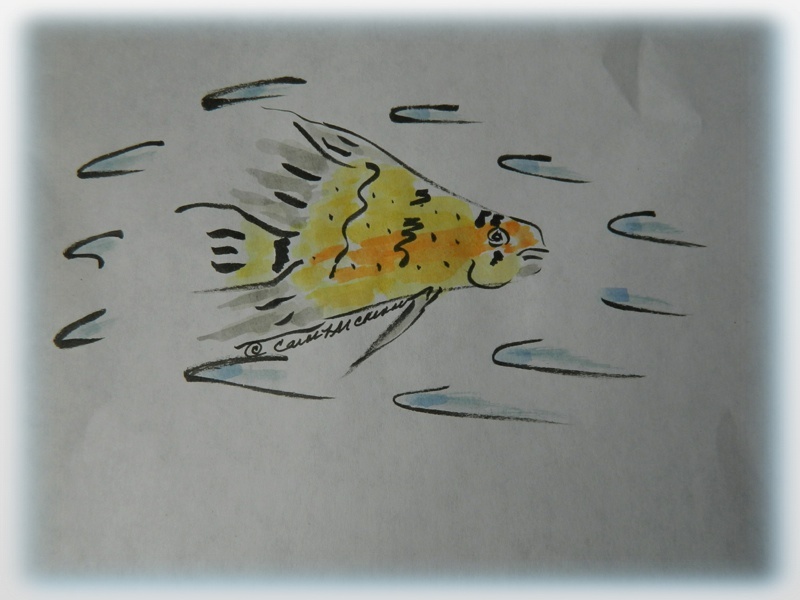 love your zen angel fish Carol! so many beautiful images....i really enjoyed your quote today!!! sweet angel fish and love the bird photos. I've been seeing baby birds too! Lovely shot of the little doves. 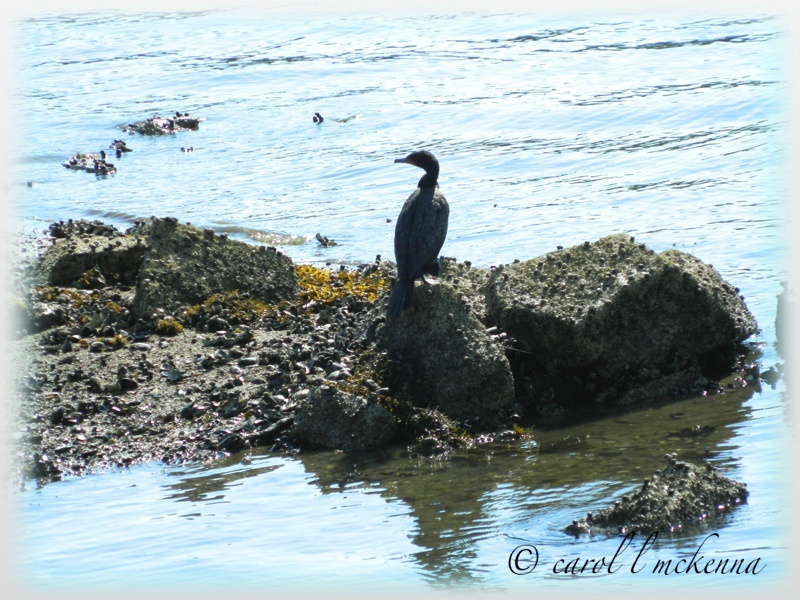 Love the Cormorant, too! I always enjoy the simple beauty of your words, photographs and artwork. Blessings to you and muse dog. The fish sketch is very sweet, and more lovely photos too! Thank you for visiting from Sunday Sketches! Your angel fish is cute, the orchid photo looks like a frilly tropical fighting fish. The doves are adorable too, how fun to see the babies! I had been wanting to see one in my yard and one has been showing up but I mainly hear the cooing rather than seeing the bird. Your haikus are thought-provoking, along with the tall ship under sail. Such a lovely collection of images and thoughts! So happy to have found you again. I LOVE the Black and White wednesday shot! My blog is also mostly art and photography. Thanks fro dropping by. I started following! Nice photos. I like the little sketch. It is adorable. please forgive my late arrival i have been under the weather. my hope is bright and full of love, may your heart feel all of those who love you ever close. 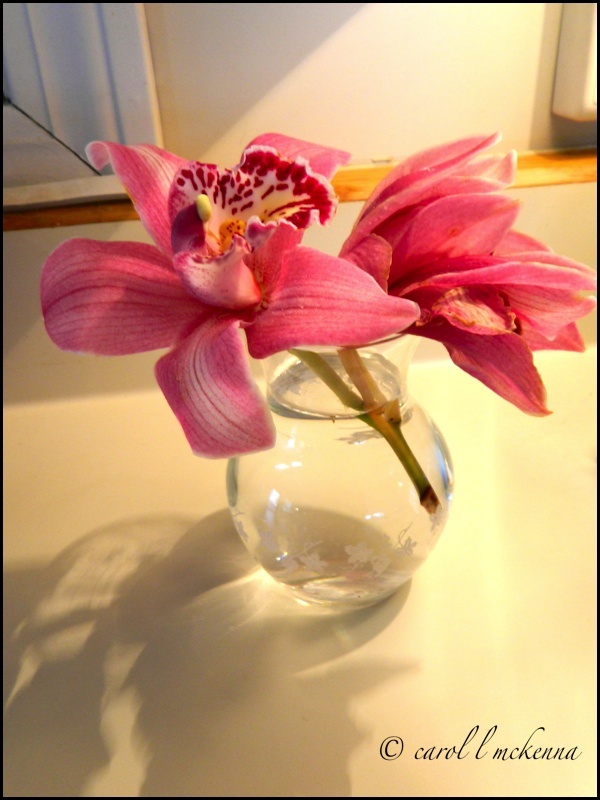 Angel fish, orchids and an intimate island! What a perfectly lovely post for the letter I. And for all the other neat memes you participate in!